Then, in keeping with my longstanding and hopefully constructive practice of pondering why the bogies occurred rather than simply lamenting the fact, I observed each was attributable to one of the three different reasons players take extra strokes in disc golf: bad execution, mental error, and bad luck. If you haven’t thought of your disc golf game from this perspective before, it might be worthwhile to check it out. Bad luck (and good luck!) will happen when it happens and luck is impossible to control (although often times ‘bad luck’ is set up by a bad decision). Errors are another thing entirely. On hole 1 my drive was thrown too low, resulting in it turning over and grinding to a halt. Cut down in its prime. It ended up well short of my normal landing area, which on uphill hole 1 at DeLa means a difficult par save- and sure enough, I took a bogey. The problem here was purely a lack of execution. I had a good, straightforward plan, didn’t vary from my routine, and didn’t have distracting thoughts floating through my brain. Quite simply, I overthrew in an effort to compensate for the cold weather, and in the process removed all the smoothness from my form. 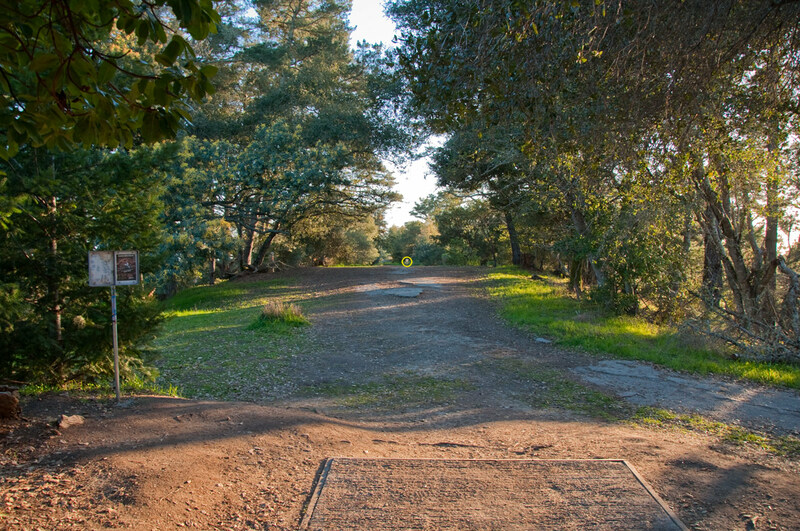 Hole 1 at DeLaveaga, photo by John Hernlund. At DeLa, hole 4 requires the player to pass through trees. The course rules at DeLa also state that the two meter rule (a one-stroke penalty for discs stuck two meters or higher in a tree) is in effect. And due to the way the fairway dips down mid-way, any air shot is at least at some risk of getting snagged in some branches. Lower shots are less likely to get caught, but on that day my drive – which seemed rather perfect as it left my hand – ended up OB. The odds of that happening were quite small, but happen it did. Oh well. Now the bogey on hole 7 was by far the most avoidable of the three. The mistake I made there was entirely mental, and those are the ones that bother me the most. My drive had left me about 70 feet from the basket, with the slightly downhill angle of the shot making it play more like a 50-foot birdie try. But here is where I screwed up: A putt anywhere between 50 and 70 feet has a less than 50 percent chance of landing in the basket. Depending on the conditions (in this case a bit of a low ceiling near the cage) quite a bit less than 50 percent. That factor (the low probability of success) alone would not be a reason to lay up rather than go for it. But coupled with the reality that hole 7 at DeLa has a very fast, rutted fairway and a green that slopes down to the basket and far beyond, it makes birdie attempts quite risky. Yet go for it I did, and the result was predictable. After a skip, rattle and roll, my comeback putt was around 40 feet . . . and I missed it. All I could think of was the fact that it took me three shots to hole out from 70 feet. Not acceptable. Think about these three bogeys, and consider whether you identify with any one of the three in particular. If you identify with Hole 1 (bad execution), you will likely see the quickest improvement through practice. Get out on a field, and get your reps in. Commit your good form and technique to muscle memory, so when it comes time for real play on the course, your body knows what to do. 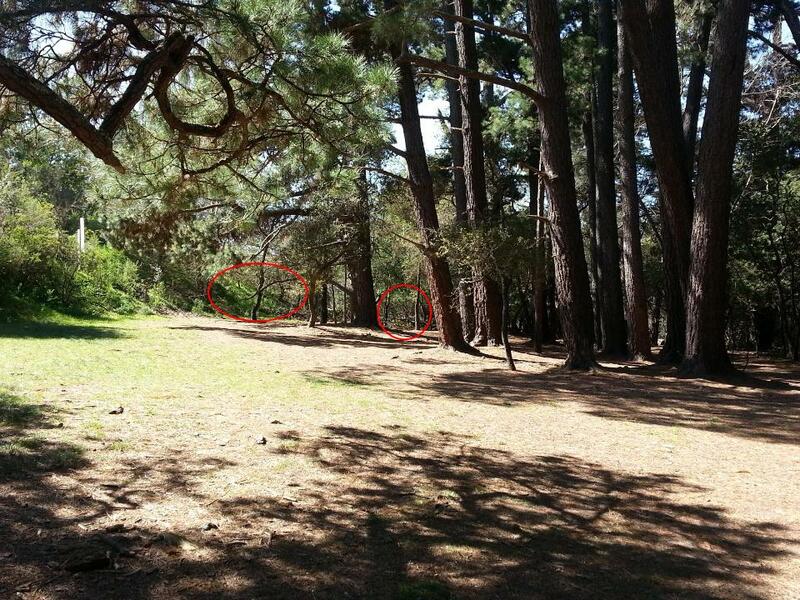 If the bad break on hole 4 seems all too familiar to you, think long and hard about whether you’re really getting more than your share of bad luck or if it’s maybe the result of leaving too much to chance too often. I believe that luck evens out over time, so if you think you’re always getting the short end of the stick it’s likely because you’re not making the best decisions. At DeLa tournaments like the Masters Cup, out-of-town players often act frustrated at what they claim is the ‘fickle-factor’ connected to the course’s sloped terrain and fast greens. The players who score best in events there, however, know that these elements require special respect and adjust their games accordingly. And that brings us to the stroke I took on hole 7. I knew the risks involved in going for that long putt with a fast, downhill green- the odds of making it didn’t match well with the odds of a miss resulting in a long comeback putt. But I went for it anyway, succumbing to whatever bad rationale happened to float through my mind at the time. Maybe it was impatience at being +2 after six holes, or maybe it was a type of bravado that led me to think nothing bad would happen if I ran the putt. But the odds played out, and what was most likely to happen did, in fact, occur. If this type of mental error costs you the most strokes in your rounds, consider it good news. These are the easiest to eliminate as they have nothing to do with your ability to play the game. You just need to learn to get better at ‘thinking’ your way around the course. No one is perfect in this respect, but those that work at it get the most out of their abilities. If you enjoy analyzing disc golf as much as playing it, it’s actually quite interesting to do a post-mortem on your mistakes. You’ll end up learning something nearly every time, and that means even your screw-ups can be productive in the long run. So which of the three do you identify with the most, and more importantly, whatcha gonna do about it? Which Worlds course will be talked about years from now? Maybe the headline of this entry should have had a qualifier related to DeLaveaga. Those that have never played DeLa may lean in the direction of the iconic Santa Cruz course because of its long storied stature and the fact that she still deserves her reputation and still requires a 1000-rated round to shoot par. Those that have played DeLa in past Masters Cups or other events may choose to go another way, though. They may remember which of the three other, much newer courses provided the greatest tournament challenge. That remains to be seen, of course, but DeLaBlahg can provide a small bit of insight from the perspective of a local. First of all, generalizations that hold true for all four courses: The combination of trees, slanted and non-grassy fairways and variable winds adds up to difficult pars if you don’t place your drive where it needs to be. But for the most part, the length of the holes is reasonable- not long just to make the hole a tough par 3 or 4- or 5 (Pinto Lake, Hole 11, 1280 feet). These courses have plenty of other factors adding to the challenge. Ryan Ranch is so beautiful right now, so dialed in with the sweet teesigns and basket toppers, it reminds us a femme fatale-type assassin. 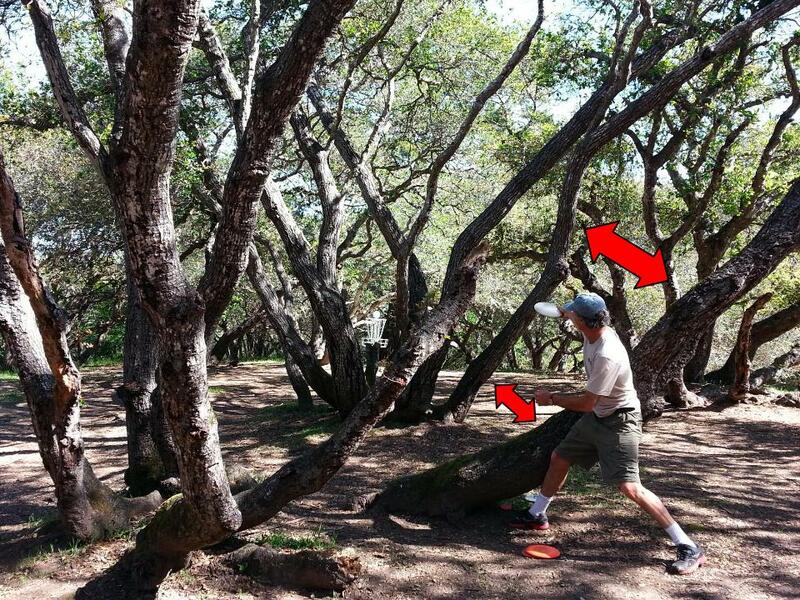 Many of the baskets are close enough to craggy brush and trees that you’ll find yourself straddle-putting often. The winds can get up pretty good since it’s mostly exposed. It’s long enough that if you arm can get fatigued at the end of a long day, you’ll do well to monitor your performance closely and adjust accordingly during the last 9 holes here- just like at the other 27-hole layouts. The likeliest of the four courses to have wind be a major factor. If the wind is up in a major way, play to minimize the damage. It’s tough because the direction changes so often, with the course being the closest to the Pacific Ocean. But this course isn’t a birdie-fest on the calmest of days, so unless you’re in the Open division and vying for a top spot, lots o’ pars are good here too. 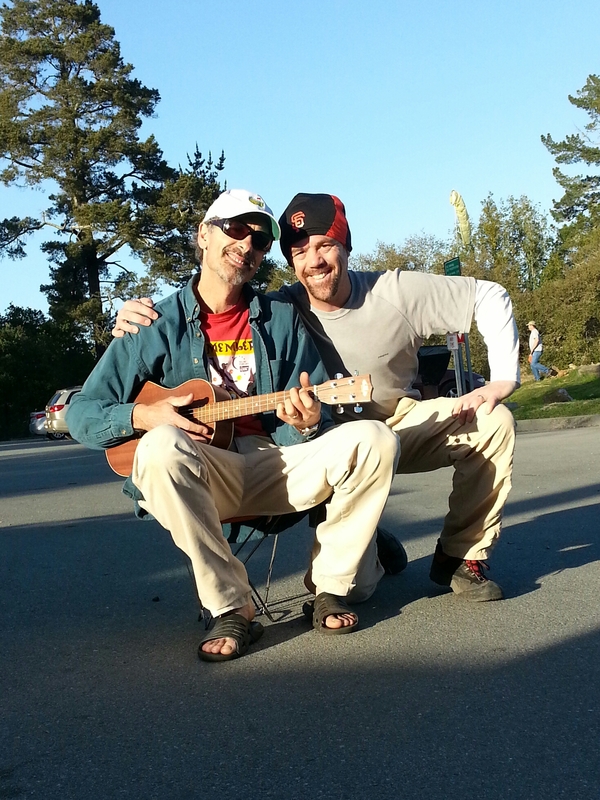 Tom Schot’s attempt to match his achievement at DeLaveaga is mostly successful at Pinto Lake. You may not like a couple of the holes that have thread-narrow dirt roads for part or all of the fairways (we don’t) but they are exacting and everyone has to play them. Most of the holes have yellow OB rope left, right, and in some case behind the pin. Make sure you know where that rope is on every shot. Especially on the meadow (upper) holes, which look so wide-open and innocuous after the first 4 holes, the OB can creep up on you very easily- especially if there is any wind to speak of. The guess here is that Pinto Lake will stand out from the three courses not called DeLaveaga. It has the significant advantage of being the location for the semi-finals and finals, after all. It’s the only course the top divisions will play more than once. But that’s the only reason we cast our vote for Pinto Lake. The other courses are epic as well, and they’re all tough, technical, long, and a big departure from the courses most competitors play regularly. We like to envision conversations years from now among people who played the 2011 Pro Worlds, spirited debates about which course ended up being pivotal in XXXX XXXXXX being crowned World Champion. Be aware of the lake on the one hole where it actually comes into play (14). DeLaBlahg accompanied Nate Doss and Valarie Jenkins to a local TV Station early this morning, then joined them for a practice round at Pinto Lake. The live segment with the local morning news co-anchors went well, and clips should be re-posted on the Worlds homepage and Facebook page as soon as the station makes them available. For now, here is the first segment as captured by the Discmasters camera on the camera on the action. The morning news team, which is small and amazingly capable, ended up doing two segments that were both a couple minutes in length. Review of the entire show later in the day on DVR showed that they even plugged the disc golf segments twice as teasers beforehand- although the repeated called it ‘Frolf’ until we corrected them during a break. 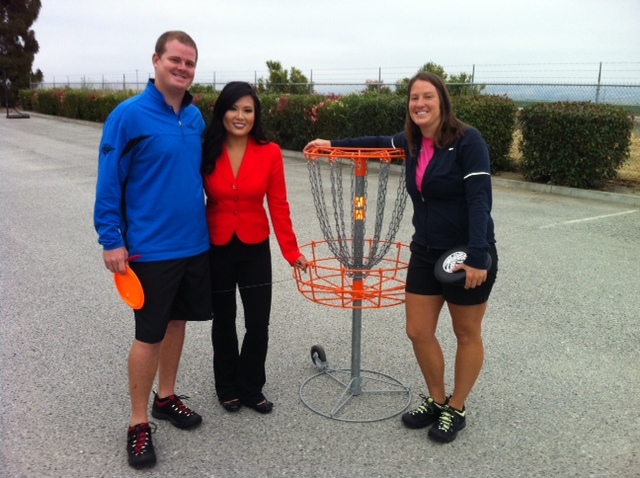 In both segments, co-anchors Colleen Chen and Tamara Berg toss putters toward an orange powder-coated DGA basket and ask Val and Nate questions. After receiving some basic instruction both showed improvement. The sound cut out some on the live broadcast during the second segment, but not enough to ruin it. That’s important, because according to the show’s producer they get a bunch of viewers right at the end, tuning in for the CBS Early Show which follows it. We’re hoping to get more coverage on KION/FOX 35 before the end of the tournament, so stay tuned. Headed to check out a couple of the Worlds courses after the TV studio shoot. After a stop at Ryan Ranch to check out the new tee signs, benches, and ‘basket-toppers‘(all looking incredible), we headed to Pinto Lake. Volunteers were hard at work laying out what will be the words ‘2011 Pro Worlds’ in 80-foot tall letters, along with a correspondingly large KEEN logo on the course’s 1200-foot hole, #11. It’ll be so big it will cover most of that long fairway and be visible from 30,000 feet. When it’s done, cameras in airplanes and/or helicopters will hopefully capture some images we can share. The yellow OB rope that will be put down on the first five holes and holes 14-18 should be there in the next couple days (by Wednesday August 3rd). Until then, pay attention to hole maps and look for the low-protruding 4 x 4 posts that define most of the OB right now. Watch out for yellowjackets on holes 10 and 12, in both cases within 50 feet of the basket. Even though this also should change in the next day or two, hole 12A doesn’t have a basket (it has a tone-pole, much of a tee (two markings on the ground) or signage (none) as of Monday August 1st around Noon. Here’s how to get there and then on to Hole 13: After completing hole 12, walk back up the hill along the OB line to the right, to keep safe from being hit by drives on 12. When you get to the tee for 12, you’ll see the tee for 12A not far behind it. 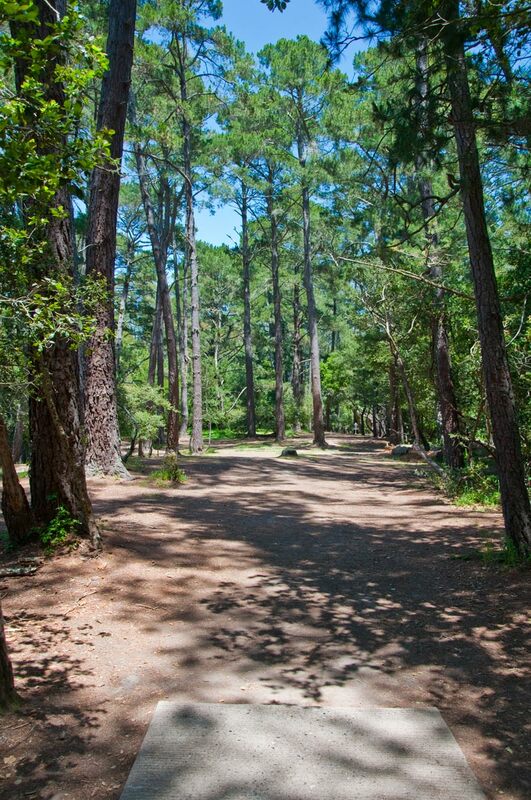 After finishing 12A, walk down to a trail on the right that cuts across toward Hole 13. Hole 18’s basket will be moved from it’s normal position about 75 feet longer, into the open grassy area short of the restrooms. There is a stake to mark where the basket will be- hopefully in, you guessed it . . . a coupla days. Max. There was already plenty to polish up in the next few days, and that sign is gonna be huge. According to TD Mark ‘DeLaDiscman’ Karleskind’s Facebook wall, 95 people played the 56-hole marathon at DeLa last weekend, with more than $1,000 and mucho canned food donated to local charities. Steve Lonhart (winner of the Open Masters division) was nice enough to take the stats from Mark and dump them into a spreadsheet (table inserted below). The competition gets tougher every year. This year’s ranks included multiple World Champions, two fists full of 1000-rated and sponsored players, and a tour bag full of players that are close to that 1000 rating and/or have won on tour before. Scheduled to play were also Nikko Locastro and Gregg Barsby, but they didn’t make it after raving at the Harding place the night before. With DeLa in the traditional ‘super short’ Ice Bowl setup, the amoun of bogey strokes players tool was again as telling as their birdie total. Nate Doss won Open with a bogey-free -29. Chris Edwards ended up in fourth place, even though he had 26 birdies to 3rd place finisher Shasta Criss’s 24 (due to his seven bogey strokes compared to Shasta’s two). In the Open Masters division Pat Brown’s 27 birdies equaled winner Lonhart’s total, but he had three bogeys compared to two for Steve, and ended up tied with Jon Baldwin for 2nd. The advanced division is even more telling. 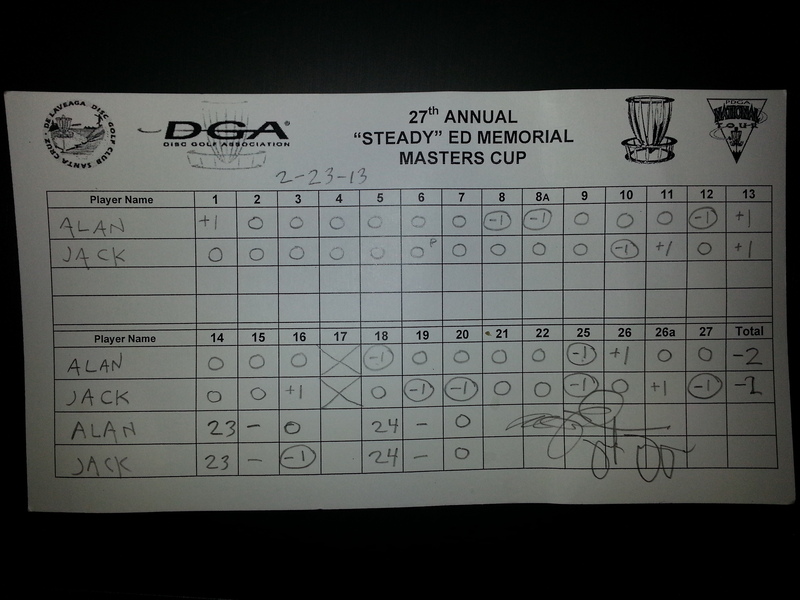 The winner, Sean Jack, shot a -9 with 13 birdies and only four bogey strokes. By comparison, TJ Goodwin had 17 birdies but only managed 6th place because of 14 bogey strokes. 65 of the 95 players signed up in Amateur divisions, with AM2 once again the most populous at 31 players. In this type of event, where all divisions earn cash (not just the Open divisions), a guy shooting -6 (the AM2 winner) wins way more money than the guy that shoots -29 (Open winner Nate Doss). And we wonder why so many people play AM2! One of the great things about disc golf is the way, when you think you’ve seen and experienced it all, something happens to make you realize you in fact have not. Such was the case for me today at Black Mouse DGC. After two decades of playing disc golf, I can’t remember anything like what happened today. I want to describe it in detail, and ask you, the reader, to share anything similar. Hole 11 at Black Mouse is (choose your adjective): devious, frustrating, challenging, ridiculous. I’ll try to describe it the best I can. From tee to basket, “as the crow flies”, it’s uphill and maybe 250 feet. But the terrain slopes steeply from left to right, and 80 or so feet from the tee the so-called fairway narrows to an opening maybe six feet wide and 10 feet tall. After that point the hole dog-leg’s sharply to the left. 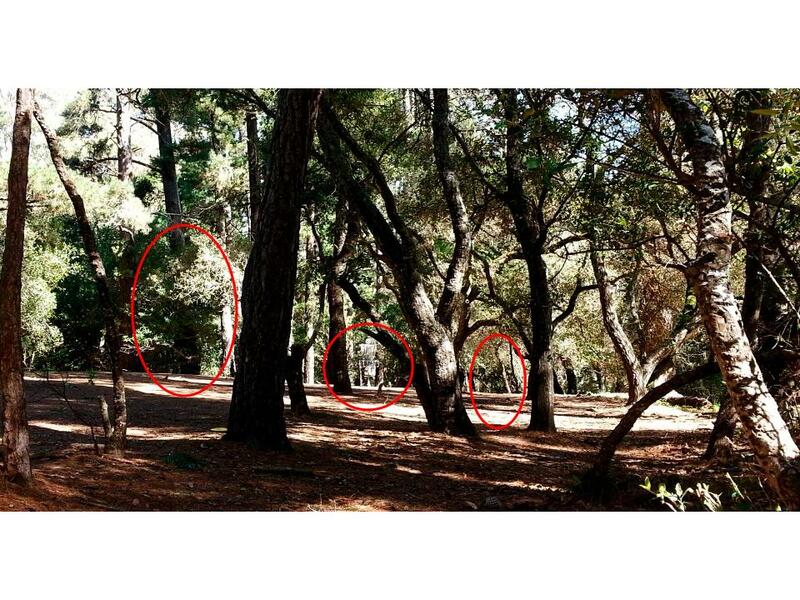 On the left of that opening is a literal wall of redwood trees, and to the right is more trees and a continued downward slope. So you pretty much have to aim for that tiny gap and throw something that will bank left after passing through, or just sit down, to give you an extremely steep upshot. I’m left-handed, and I try to throw a side-armed Surge driver through that gap that will ideally curve left and uphill toward the basket. Today I missed by at least 10 feet to the left, hit one of the Redwoods, and dropped straight down. 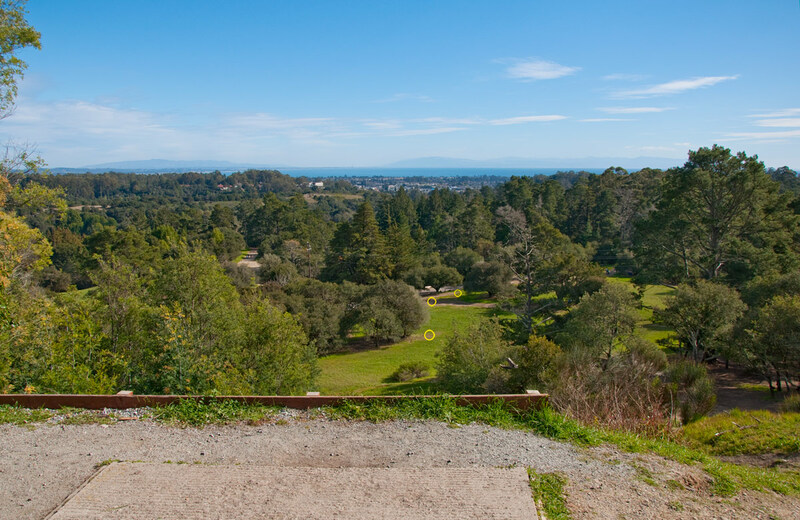 My choice was to either sacrifice a stroke by tossing my disc a few feet to the right and hope I’d get a clean look at an upshot for a bogey four, or try to squeeze a blind shot through the wall o’ Redwoods in the general direction of the basket. I knew it wasn’t the wise choice because the gap was barely the width of a disc, and there were plenty of other trees to get past in the fairway, but I chose it anyway because it seemed more fun. I made sure to keep it flat to avoid a second wall of Redwoods closer to the basket, and let ‘er fly. The first and main objective was accomplished as soon as the disc made it through the ‘crack in the wall’. Since the disc disappeared from view immediately, I listened closely to monitor its progress. I was hoping to hear nothing, actually, since that would mean the throw got as far as possible without hitting a tree. And that’s just what I heard, until I was . . . . SHOCKED BY THE SOUND OF CHAINS! Honestly, I don’t remember being more pleasantly jolted by that sound in all the time I’ve played the game. It was the perfect tone, too, where you just know it stayed in the cage. I’m interested to hear if any readers have experienced anything comparable. I was hoping to scratch out a bogey, and in an instant realized that instead I birdied a hole I’ve only birdied once before. Do you have a similar story of being ‘shocked by the sound of chains’?